Franklin Painting employs experienced painting technicians who are skilled in a range of exterior painting services, including preparation, staining, carpentry, powerwashing, wood repair and restoration. Exterior painting requires a good knowledge of materials and surface preparation so that a new coat of paint can stand up against large swings in temperature, rain, snow, ice and sleet. From paint stripping and power washing to refinishing and staining, our exterior paint services will give your home a brand new look and amazing curb appeal. Nothing tops the look of a finely painted and trimmed New England home. Since the changing seasons also dictate when we can work, it’s important to schedule your spring and summer painting with us early in the year. Check out the work we did on this 100-year-old home in Wethersfield! When our crew was working on the exterior painting of this magnificent home in a historic area of Wethersfield, neighbors and townspeople were coming by to take pictures. The home had been painting white for 100 years and the new look caught the attention of everyone who was familiar with the home. The owners loved the new look. If you have any questions regarding exterior painting, our professional paint technicians are here to help. From preparation of the exterior of your home to the final coat of paint, we want to ensure that your entire experience is enjoyable. We know you’ll love the final look of your paint project, and we are here to make sure of that. Our estimator can offer a set of renderings once you choose Franklin Painting as your exterior painting contractor. Based in Farmington, we serve Avon, Glastonbury and Simsbury, and all of central/coastal Connecticut. We will take photos of your home and using a digitizing tool on the computer, we will identify all of the areas that will be painted. Then we can input your color choices for trim and walls, and create renderings that will let you see how your house will look in several different color combinations. Let us help make the first impression of your home a great one. Whether the paint on your home is worn out or you’re just ready for something new, you can trust us to provide superb exterior painting services. Our exterior paint experience has helped us deliver exceptional results, and our attention to detail means homeowners can expect only the best when they hire us to complete their exterior painting projects. Did you know that a fresh coat of paint on the exterior of your home can actually increase the value of your house? Larger projects, estates and commercial buildings may require special lift access to expedite the painting process, especially when heights makes ladder access too dangerous. Our employees are fully trained in lift operation and will never disturb any landscaping or structural features around your home. On most homes, traditional ladder access and staging will allow us to complete the exterior painting project with ease. We always use dropcloths over roof sections and shrubbery, and we make sure to leave your home as clean as it was when we started. Many of our clients have vacation homes at the shore or in the mountains that need to be protected from the elements. We provide exterior painting services for vacation homes, condos and cabins to ensure that your little slice of paradise will remain a relaxing and peaceful place to visit. 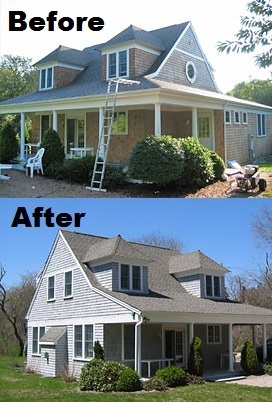 Check out the “before-and-after” photos of this adorable little vacation home on the East Lyme shoreline. A fresh coat of paint made all the difference, and our crews made sure to work in a timely manner to allow the homeowners to get back to enjoying their favorite vacation spot. Homeowners have their own unique style, and exteriors can reflect that style. A new color can make a home’s general appearance more sophisticated and elegant, more charming and welcoming, or cozy and comfortable. When you choose Franklin Painting to complete your exterior painting projects, we will make sure the outside of your home surpasses your expectations.